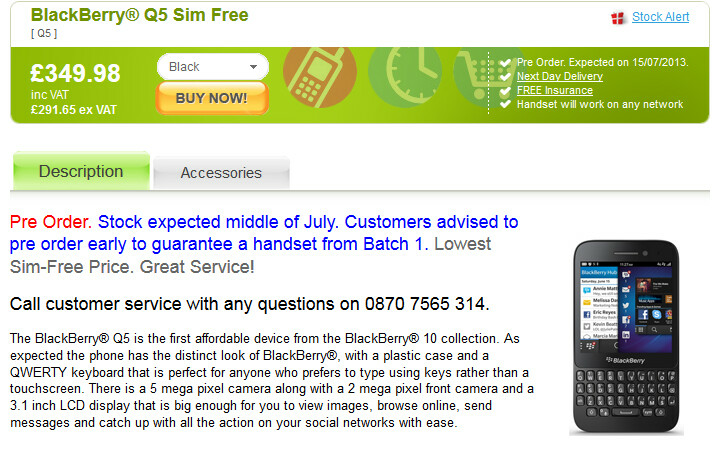 Pre-order period starts for BlackBerry Q5 in U.K. The BlackBerry Q5 is now available for pre-order in the U.K. The first of two low to mid range BlackBerry 10 models due this year, the BlackBerry Q5 has the same 3.1 inch touchscreen, sitting on top of a portrait oriented physical QWERTY, as the BlackBerry Q10. Even the boxy 720 x 720 resolution is the same. 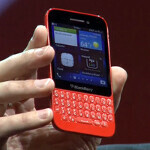 But unlike the premium BlackBerry QWERTY with frets, the QWERTY on this model is a more basic keyboard. The other low end BB10 model expected to be released this year, the BlackBerry Z5, was recently leaked. Available in black, red, white and pink, the BlackBerry Q5 will be seen throughout Europe, Asia, Latin America, Africa and the Middle East and will be powered by a dual-core 1.2GHz processor while surprisingly 2GB of RAM will still be on board. 8GB of native storage can be expanded using the 32GB microSD slot and the cameras on back and front weigh in at 5MP and 2MP respectively. A 2180mAh cell keeps the lights on. The phone will launch on July 15th, but can now be reserved from U.K. retailer Unlocked Mobiles for 349.98 GBP ($545 USD) SIM free and including VAT. Only the black and white models are currently being offered by the online store. Once the phone is launched in the middle of next month, other U.K. retailers like Carphone Warehouse and Phones4U are expected to offer the device with a subsidized two-year contract pricing. BlackBerry CEO Thorsten Heins says that there will be a pair of low end, mid-range and top-shelf BlackBerry 10 models launched before 2013 is through. It is assumed that the already released BlackBerry Q10 and BlackBerry Z10 units are the mid-range devices with the BlackBerry Q5 and BlackBerry Z5 in the low to mid-range category. A phone called the BlackBerry A10 is rumored to be the all-touch high end model for the holiday season mentioned by Heins earlier this year. The A10 is said to be launching in November and has been already confirmed by Sprint. The BlackBerry Q5 can be pre-ordered in the U.K.
450$ a midrange?this company seems to be in trouble!!! Q10 costs another $300 in my country (yup, $750), that is a lot of difference. so at that price, it would most likely cost the same as the XZ or S4 here in aussie.